Helga’s Post #104: Love is of course the theme du jour. Chocolates, flowers, kisses and all manners of other romantic gestures abound. But Valentine’s Day is also fraught with dangers: husbands and boyfriends, and girlfriends too, beware, you will be judged! Relationships are known to have blossomed if you do the right thing. Or soured if you failed. Frequently worse. Much worse. So how can I write about love today without repeating clichés and boring you out of your wits? I hope to do so by sharing with you an article about love that relates specifically to writers. It offers some surprising insights about this most basic and precious of all human emotions. I am presently on the road to southern California all the way from Vancouver (with my own Valentine), so am deprived of time and technology to write my own post. That’s why I am taking the easy way out and quoting someone else’s words of wisdom. The article is by Daniel Jones of the New York Times. The picture is compliments of the talented Brian Rea. Sweet Valentine’s Day to all of you and may the miracle of love last all year. A few months ago, I read several articles touting the health benefits of writing in a deeply personal way. Studies had shown that writing introspectively on a regular basis can lead to lowered blood pressure, improved liver function and even the accelerated healing of postoperative wounds. The study’s subjects had been told to write for short periods each day about turbulent emotional experiences. I bet a lot of them wrote about love. As the editor of this column, I have spent much of the last decade reading stories of people’s turbulent emotional experiences. They all involved love in one way or another. Which isn’t so surprising. Who hasn’t been stirred up by love? But these writers had spun their experiences into stories and sent them here, where more than 99 percent must be turned away. Although the would-be contributors may be happy to learn of the surprising health benefits of their writing, I think they hoped for a more glamorous reward than improved liver function. Lately I have been thinking about those tens of thousands of passed-over stories and all the questions and lessons about love they represent. When taken together, what does all this writing reveal about us, or about love? Here’s what I have found. 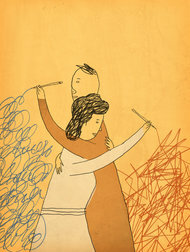 First, and most basic: How we write about love depends on how old we are. In writing about love, the story of how we met looms large because a lot of us believe, validly or not, that a good meeting story bodes well for the relationship. What do we consider to be a good meeting story? When it involves chance more than effort. You get bonus points if the chance encounter suggests compatibility, like mistakenly wheeling off with each other’s shopping carts at Whole Foods because your items had so much overlap, you got the carts mixed up. Pretty soon it’s time to get a room. It seems the harder we work at finding love, the more prone we are to second-guessing the results. High-volume online daters worry about this, along with those who routinely attend singles events. When some people write about love, they can’t find the right words to capture the intensity of their feelings, so they rely on stock terms that are best avoided. These include (but are not limited to): amazing, gorgeous, devastating, crushed, smitten, soul mate and electrifying. Women and men may feel love similarly, but they write about it differently. A lot of men’s stories seem tinged by regret and nostalgia. They wish previous relationships hadn’t ended or romantic opportunities hadn’t slipped away. They lament not having been more emotionally open with lovers, wives, parents and children. Women are more inclined to write with restlessness. They want to figure love out. Many keep mental lists of their expectations, detailing the characteristics of their hoped-for partner with alarming specificity and then evaluating how a new romantic interest does or doesn’t match that type. Men almost never describe the characteristics of their ideal partner in this way. Even if they have a specific picture in mind, few will put that vision to paper. I wonder if they’re embarrassed to. Another list women frequently pull together is “The List of Flawed Men,” in which they dismiss each man they have gone out with over the last year with a single phrase. There was the slob with the sideburns, the med student who smoked too much pot, the gentle Texan who made felt hats but couldn’t commit, and the physically affectionate finance guy who always dropped her hand when he saw his friends. This series of bad encounters has left them exasperated to the point of hopelessness, so they try to see the humor in it. Men rarely compose that kind of list, either. In this case, I wonder if it’s because they’re afraid to, not wanting to be seen as belittling women. In general, men write more cautiously about women than the other way around. Love stories are full of romantic delusion, idealizing love to an unhealthy degree. But in the accounts I see, men and women delude themselves in opposite directions. A woman is more likely to believe her romantic ideal awaits somewhere in the future, where her long-held fantasy becomes a flesh-and-blood reality. I don’t know if men are worse than women when it comes to romantic rejection; they are clearly worse when it comes to literary rejection. Even though only 20 percent of submissions come from men, they send more than 90 percent of the angry emails I receive in response to being turned down. To these men, no does not mean no. No means the start of an inquiry as to how this possibly could have happened. Writing about love can be similar to falling in love in that we must be as vulnerable on the page as we are in person when revealing ourselves to someone we hope will love us back. That means exposing our flaws and weaknesses and trusting we will be seen as more appealing, not less, for having done so. Good writing about love features the same virtues that define a good relationship: honesty, generosity, open-mindedness, curiosity, humor and self-deprecation. Bad writing about love suffers from the same flaws that define a bad relationship: dishonesty, withholding, defensiveness, blame, pettiness and egotism. It has been remarkable to watch the evolution in stories I have received from gay and lesbian writers. A decade ago, their stories focused on issues of marginalization, identity, coming out, and of strains with family members. Within a few years, their focus had turned overtly political in the fight for equality and marriage. Today, gay writers have largely shed that baggage. They write about looking for love, marrying, starting a family, being a parent, even getting divorced. Sexual orientation that had once been central is now incidental. Which seems like a nice change. With Valentine’s Day near and the right words about love always so hard to find, let me close by simply wishing you an amazing celebration of electrifying romance you never forget and always remember. This entry was posted in Romance, Theme, Writing and tagged Daniel Jones, love, New York Times, valentine, Writing about love by Helga Bolleter. Bookmark the permalink. Thanks, Silk. I hope you too are enjoying a great Valentine’s Day with that most special man in your life. Arrived safely down south and just getting spoiled by blue skies and 30C plus weather. Pure magic! Absolutely fascinating to get such a clear analysis from someone who has had a lot of data for his research. Thank you. I agree. It’s educational and entertaining to see how the two genders feel about love. Thanks for your comment.